Bigger and better…we are happy to announce that Al Fresco Springs 2 is opening in November 2017! Our first hot springs resort, Al Fresco Springs 1, opened in September 2016. Since then, we’ve received a lot of positive feedback from guests. We took the best features of the first resort and improved upon them. Al Fresco Springs 2 will have five rooms, including one for seniors, a conference room for rent, bigger pools, unlimited use of the videoke machine, boardgames, and more amenities you can enjoy! It’s the perfect staycation for friends and family. Swim and unwind in our bigger hot spring pools. Your body and mind are sure to be at ease as the hot temperature of the pools relaxes your muscles. 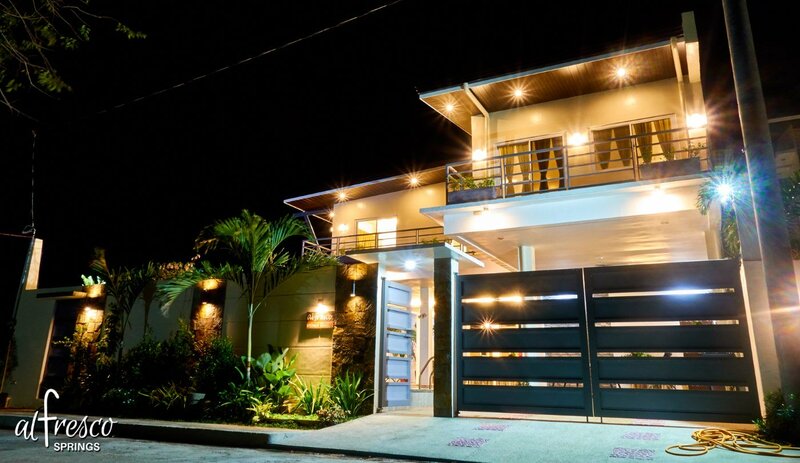 Located in a private subdivision in Los Baños, Laguna, you will wake up to the cool breeze and take in the tranquil views of Mt. Makiling. Bask in the sun or lounge and relax on one of the couches. The resort itself is Instagram-worthy; the interiors and custom made furniture were carefully designed to bring only the best comfort and provide a luxurious feel for our guests. Our beds and mattresses are high quality so expect a comfortable and pleasant night’s rest. Al Fresco Springs 2 can accommodate a maximum of 30 people. Al Fresco Springs 2 will also feel more open as we have added more glass for the front-facing curtain walls. For your cooking needs, there’s a barbecue grill, refrigerator for your use and other optionals. We pride ourselves in the cleanliness, comfort, and security of our resorts. The spacious resort is a quick drive from Metro Manila. We are now accepting reservations so take a break and book with us now! Visit the Al Fresco Springs 2 page for more information about our new private hot spring resort.